The residential foundation problems are related to volume changes in the clay soils which underlie the house. These particular clay soils have what engineers call a ” high plasticity”. This is a term that is used to describe a clayey soil which remains “plastic” (or in a “moldable” state), neither turning liquid nor crumbling apart, over a wide range of moisture contents. This is unlike other fine-grained soils (mixtures of sands, silts and clays) which either liquify or crumble apart at the extreme ends of a fairly small range of plasticity (moisture contents.) Liquifying or fluid flow occurs at the wet end of the moisture scale, whereas crumbling occurs at the dry end. Many of you might compare a highly plastic clay soil to the popular child’s toy, “Playdough®” in that highly plastic clays can be molded into various shapes or, when worked in between the thumb and index finger, one can form a long, thin “ribbon” of clay. The reason why these soils remain plastic over such a wide range of moisture contents, is because they have an “affinity” or attraction for water. Actually, they have an attraction for the H2O water molecule. In order to understand this, you must understand that unlike silts or sands, clay particles are microscopic in size. We cannot see them with our naked eye. Walk along the beach and grab a handful of sand and you can easily sort out individual sand particles. You can’t do this with clay. The clay particles (actually platelets) are microscopic in size. They are, in essence, ions or molecules and they bond together (to one another). Most clay ions also chemically react or interact with the H20 water molecule. They usually want to bring in (attach) water molecules to their crystalline lattice (or molecular structure/chain). Clay soils usually evolve from the weathering of minerals and, therefore, take on the mineral’s crystalline structure or chemical make-up. Typical clay minerals in our area are -silicates of either iron, magnesium or aluminum. Some clay soil minerals have a very high attraction for water. Instead of wanting to add one or two water molecules to their structure, they want to add many more. These are the expansive clays. When this happens, the individual clay ion’s crystalline structure or lattice dramatically grows in size. When all the millions and billions of clay ions/molecules underlying a foundation footing absorb large numbers of water molecules, the soil dramatically grows in size. In the real world, where we live, this volume change can be significant. The reverse is also true. And here is where the foundation problems seem to arise. Whenever the clay ions give up attached water molecules (from evaporation or plant root uptake) they shrink in volume. Extreme examples of this type of shrinkage are the formation of large cracks in the ground surface and/or the ground pulling away from a home/foundation during the hot, dry summer months or during droughts. Examples of foundation problems are differential settlements caused by shrinkage of the clay soil. A simple analogy for this phenomena would be, “clay soils are like sponges”. Whenever sponges soak up water they swell in volume. When left on the counter to dry, however, they shrink back down to a very small size…only to puff-up again when placed into contact with water. Clay soils are also like sponges in that when they become wet, they become soft or softer. When dry, they become very hard. Place a heavy load on dry clay soil and it goes nowhere or settles very little. The ground will support a sky-scraper! When wet or saturated however, don’t even think about driving a riding lawn mower across the ground. It will sink up to its axle. Hence, when living in a house constructed on highly plastic clay soils (particularly swelling clay soils) it is very important that the owner make sure that the drainage conditions around the home are monitored and maintained annually, so that surface water runoff always flows away from the home and never stands or ponds beside it. If this ever occurs, and the ground alongside and beneath a home (foundation footing) becomes wet or saturated during heavy rains or throughout the rainy season (due to poor drainage conditions, overflowing gutters, lack of gutters, etc. ), then the house may slowly settle into the ground in the areas where the clay soil has become softest. This, alone, can lead to differential (or uneven) foundation settlement. But another, and often more serious problem occurs during the following summer or fall after the hot, dry weather we typically experience in the North Alabama geographic area. The soils that stayed extremely wet throughout the year, and swelled accordingly, shrunk dramatically by the time July and August rolled around. The portion of the house resting on this formerly wet ground also settles (dramatically) along with the shrinking clay. Believe it or not, however, this common problem can always be avoided during foundation construction if builders would simply admit that these soil conditions exist and recognize that they need to have each building site evaluated by a professional soil scientist or geotechnical engineer prior to house construction. If not, it is likely that the builder will utilize the standard shallow-bearing foundation, and place the footings or foundation just below or within a few feet of the ground surface. 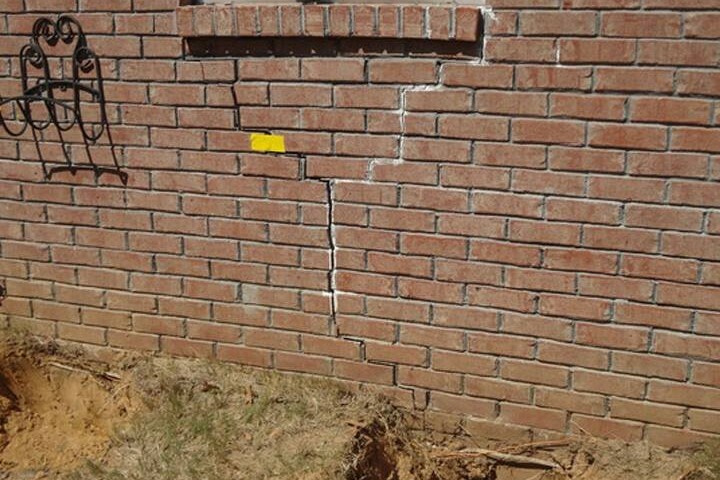 Soil shrinkage-related settlements or movements will eventually lead to foundation settlement cracking and/or the formation of large cracks in brittle construction materials such as brick veneer and sheetrock. This is almost a guaranteed.